ST LOUIS PARK, Minn. — The bitter cold forced schools across Minnesota to close for most of the week. But while students of Benilde-St. Margaret’s School in St. Louis Park stayed at home, class was still in session online. “Some years we have more snow days or online days than others but this has definitely been the most… three in one week,” said Reilly Rahill, a BSM junior. Rahill and classmate Maggie Murnan have been working on their biomed group project all week. 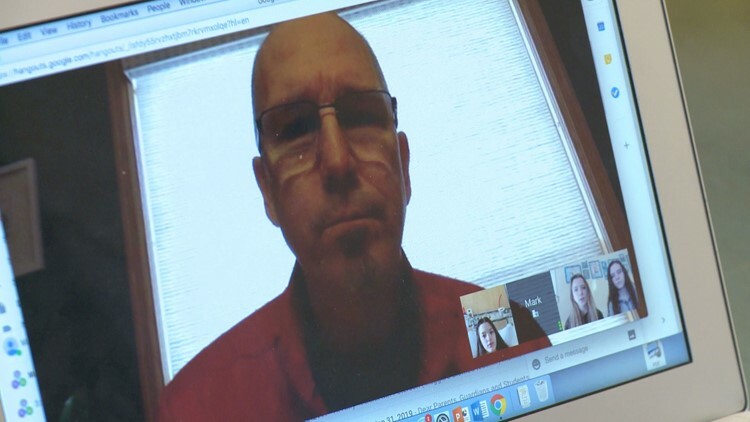 Thursday morning, they did a Google Hangout with another classmate and teacher Mark Peterson. It was a chance for them to ask Peterson questions. Another Google Hangout was planned for later in the day with the entire class. Mark Peterson, a BSM biology and biomedical science teacher, holds a Google Hangout with some of his classmates on Thursday morning. “It’s been a few years having to use it from time to time. This is probably the longest stretch we’ve ever had to use it. Three days in a row is pretty significant,” BSM Senior High Principal Susan Skinner said. According to Skinner, they first launched online school during the 2013-2014 school year. BSM was one of the first schools in the Twin Cities to roll out these virtual sessions for when unexpected closures happen. Skinner is also able to check in on virtual classes. The school provides laptops and makes sure all the students have access to WiFi. “It’s nice to be able to still be in contact with them and be able to get your work done,” Murnan said. Skinner said most students end up doing 3-4 hours of school work a day. And while some students would rather have the full day off, Rahill said she prefers this over having to potentially add any days to the end of the school year.